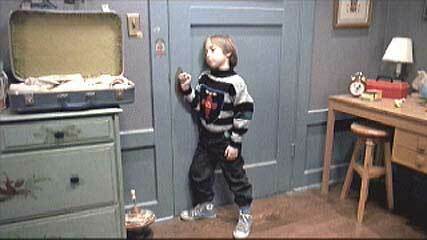 Alex Vincent wears light blue high top Converse “Chuck Taylor” All Stars in the film. Andy checks out his new room and toys, but is fearful of finding another Chucky. Child’s Play 2 reminds you of the old exorcist joke — What happens if you don’t pay your exorcism bill? You get repossessed! That’s how this sequel to the surprisingly popular original horror film about a talking doll possessed by an evil spirit begins. The story opens at the Good Guys Dolls toy factory, where the president of the company is very upset by all of the bad publicity generated by tabloid reports about events that happened in the first film. So instead of destroying the original Chucky, they take it back to the factory, clean it up, give it new parts, and just as we think things are going to be normal again (yeah, right), the toy factory worker who is assembling the doll is electrocuted by the spirit of Chucky taking over the doll again. At this point will Mr. Sullivan (Peter Haskell) the toy company president order it destroyed? Of course not, Mr. Mattson (Greg Germann) the company flack who is running damage control for the company decides to take it home to see what the problem is. We also find out that Andy Barclay (Alex Vincent) is staying in a youth authority center because his single mom has been institutionalized due to the shock of the events in the first film (probably lack of a big enough paycheck for part 2). Vincent and Brad Dourif as the foul-mouthed voice of Chucky, are the only two returnees from the original film, and the film focuses mainly around the idea that Chucky must grab Andy and get him alone so that he can say his incantations, take over Andy’s body and escape the confines of his toy shell. Andy’s foster mom introduces him to Kyle, their other foster child. Child’s Play 2 follows through with two standard features of movie sequels: all the adults or authority figures are totally clueless despite what happened in the past and what currently is happening and the monster has amazing mobility to get around and be in every scene (for example, think of the shark in the Jaws sequels). The newly reconstituted Chucky immediately gets right back into his favorite pasttimes of being the psychopathic killer of anyone in his way and tracking down Andy Barclay. After using Mattson’s cell phone to cleverly find where Andy is staying and then killing Mattson, Chucky is immediately able to find his way into the new foster home where Andy has been assigned by the youth center’s counsellor, Grace Poole (Grace Zabiskie). Here we meet most of the rest of the characters for the film, Joanne and Phil Simpson (Jenny Agutter and Gerrit Graham), Andy’s new foster parents, and Kyle (Christine Elise) an older teenaged foster child who is also staying with the Simpsons. Although Joanne initially shows sympathy for Andy, Phil shows very little, especially after Chucky gets into the house and starts creating havoc which is blamed on Andy. The rebellious Kyle is the only one to believe Andy, partly due to her own experiences with adults, and because she stumbles on the evil deeds of Chucky and realizes that Andy couldn’t do those things. Since most of the reason for watching horror films is to experience the details yourself, suffice it to say that Chucky continues with his murderous ways (adult characters, beware) until there is a final showdown between Chucky, Alex, and Kyle at the Good Guys factory in the automated manufacturing rooms where the Good Guys dolls are being made. (You can tell that the success of the first Child’s Play garnered the sequel a much larger budget) As a result, the ending has sort of a surreal quality to it, especially when Chucky keeps popping up again after you think the good guys have finally got him. Chucky goes after Andy to take his soul. The phenomenon of Chucky was one of those movie surprises that nobody could predict. For some reason the concept of a foul mouthed doll possessed by an evil spirit pushed the right buttons in audiences out for a cheap thrill and a sardonic laugh and so the cult of Chucky was born and became a part of our pop culture. Everyone one understood what it meant several years ago when former NFL football coach and television analyst Jon Gruden was given the nickname “Chucky”. It wasn’t due to any evil deeds on his part but rather that look on his face and intense behavior on the field that got him the name. And so the cult goes on and on with three more sequels. Child’s Play 2 has a few good surprises and effects. 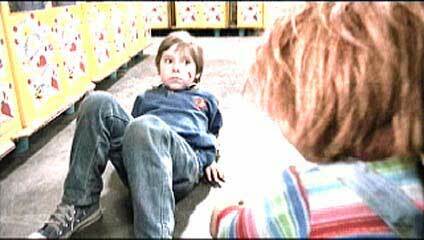 You feel sorry for young Alex Vincent. His Andy looks so nice and innocent and his demeanor is so pleasant that you wonder why no one in these films ever seems to believe that he isn’t the bad kid in the movie. Christine puts in a good performance as the rebellious Kyle, and is one of the few highlights. It’s too bad the adults never are given an opportunity to do anything intelligent or sympathetic, but that’s what the genre seems to be about. There is a certain amount of humor in this film. Whether it is intentional or not probably isn’t important, but there are a few places where fun is poked at corporate America, yuppies, schools, and the foibles of adults themselves. Most of the Chucky bits are so over the edge, it is hard to take him too seriously, especially when you see this two foot toy doll overpower much bigger teens and adults several times his size. Maybe it’s all in the leg motion. John Lafia at least keeps the film going at a fairly fast pace, which is no mean feat considering how little there is to the story. But face it, you are going to see this movie to see some horror, gore and mayhem, so don’t worry about any plot or character development getting in the way. Chucky goes after Andy with a knife. Chucky tries to ensnare Andy’s feet in some tubing. 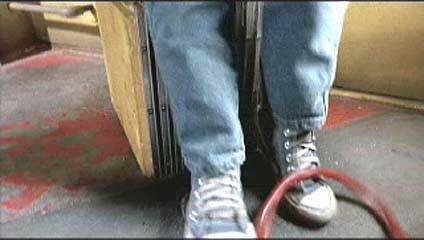 Alex Vincent in his role as Andy Barclay wears blue high top chucks throughout the whole film. They help give him a distinctly innocent look in contrast to the evil Chucky and clueless or indifferent adults around him. The cinemaphotography keeps them in play most of the time you see Andy in a scene. The best chucks shots occur during the chase scenes at the toy factory when Chucky is trying to catch Andy and kill him. Andy struggles to climb up the conveyor ramp and escape from Chucky. Child’s Play 2. (1990) Alex Vincent, Jenny Agutter, Gerrit Graham, Christine Elise, Brad Dourif. Directed by John Lafia. Categories: Drama, Horror.